The future of three state-owned airlines of South Africa looks stronger together as merger talks are started according to the minister of public enterprises. Pravin Gordhan told local media sources on Sunday that discussions regarding the merger of three government airlines, SA Express, Mango and South African Airways had already started and would continue this week with other relevant ministers. Mr Gordhan stated that was starting discussions this week with other departments, including the Treasury, with a view to evaluating the research work already completed by consulting firms as to the future of the airlines, "We must ask which areas we can rationalise, use one another’s resources,” he said. 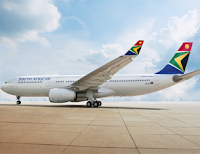 The minister also stated that there had already been cooperation between SA Express and South African Airways, "long before we started the discussion, this has been in action. SA Express is grounded and SAA management has really come to the party to take on passengers and take on other flights and put on certain flights that they would not traditionally do. That is a great example of working together,” he said. There is much restructuring needed to return all three airlines in to lean economically viable and profitable operations, as each has been brought back from abysmal situations over the last decade. Many state mismanagement, neglect and corruption at all levels of management as the main causes of their poor financial performances. South African Airways is now under its 8th CEO in as many years and a complete board change at SA Express was effected last week. Whilst internal South African mergers are being discussed by ministers, there could be another avenue of rescue, at least in the case of South African Airways. The CEO of Nairobi based Kenya Airways has not ruled out a special deal with the South African carrier for the benefit of both airlines. Sebastian Mikosz told local media that a deal was not out of the question and that he would see 'what they can do together' as they seek to close the gap with the continentals premier airline - Ethiopian Airlines. Kenya Airways is the third largest African airline, by passenger traffic, SAA is currently number two and out in front is Ethiopian and it is known that Kenya is seeking a closer relationship with other airlines in an effort to cut losses and return to profit. Any tie-up between Kenya and SAA could be as limited to a codeshare deal or a much more extensive joint venture, Mr Mikosz told media. Kenya Air itself is not in the greatest of financial health, it was taken under government ownership recently after posting record losses in 2016 and is, in the process according to the CEO of 'healing itself'. Greater cooperation with other airlines, both inside and outside the continent would greatly help that healing process.